You've been spending more time in the yard, and have resorted to using the outdoor dining table as a makeshift potting bench. Trouble is, you have to clear off everything when you actually want to sit down and eat outside, in addition to cleaning up all that soil. Sounds like it's time for a potting bench. Smaller than a greenhouse or regular outdoor shed, a potting bench is a logical first step for gardening enthusiasts who don't have the room or don't want the expense of something larger. 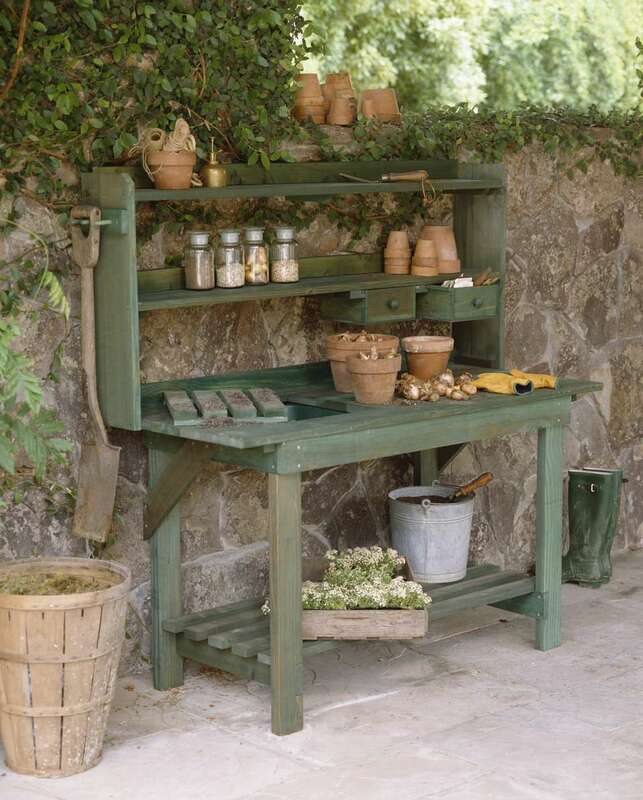 Potting benches can be situated against the house or an outdoor structure, or can be freestanding. Make sure it is the right height - so that you will not be reaching up or bending over to pot-up your plants and cuttings. Select a model with at least a couple of shelves, or install some if the bench will be located in a shed or against the house. Locate it near a hose so that you can easily clean pots and surfaces, along with water new plants. If you decide that you want a separate structure, the next step would be a potting shed - a small building with a roof that functions somewhat like a greenhouse. Unlike a greenhouse, however, a potting shed is not intended to provide a place in which to grow plants, so don't leave any in the shed for any great length of time. Sheds are a good place to store extra tools, pots, soil, seeds and amendments.